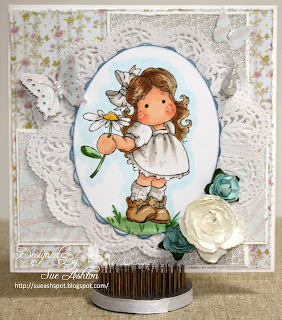 Bizzy Becs Store Blog: Tilda with Daisy from the new Sweet Crazy Love Collection. Tilda with Daisy from the new Sweet Crazy Love Collection. I have used another of the new Magnolia's from the 'Sweet Crazy Love' Collection, these stamps are available to order from Bizzy Bec's on-line Store, Bec is also taking order for the next 'Princes and Princesses Collection' you can see them HERE.I have coloured Tilda with Copics on Xpress-It paper, these are available at Bizzy Bec's along with the Doily and Flowers. Don't forget too, to join in our February Challenge at the Challenge Blog HERE, great Prize up for grabs. I love her in the whites! Beautiful. I think this is one of my favorite stamps and I love her on your card. This card is very beautiful. I love it. Wow this is gorgeous Sue, tilda is so sweet, and all your details are stunning. This card is charming, so sweet !